The start to 2016 has been frustrating for investors to say the least. Even though we’re only two months into the year, stocks have been under selling pressure over much of this time. Similar to the sharp selloff that occurred from mid-August to early November last year, investors’ concerns have been mainly focused on markets and economies outside the United States. Last year’s selloff was triggered by a sharp decline in China’s stock market and concerns about China’s slowing economic growth. In the latest decline, concerns remain about China’s weak stock prices and slowing economy but have also broadened to include Japan’s negative-interest-rate policies and the financial health of European banks. We believe current market turmoil is overdone. Moreover, we believe a recession is unlikely. To understand why, we think it’s helpful to review the primary causes of this latest market selloff and the likely implications for long-term investors. What does the latest market turmoil mean? This chart is of the price of oil between 1987 and the present. 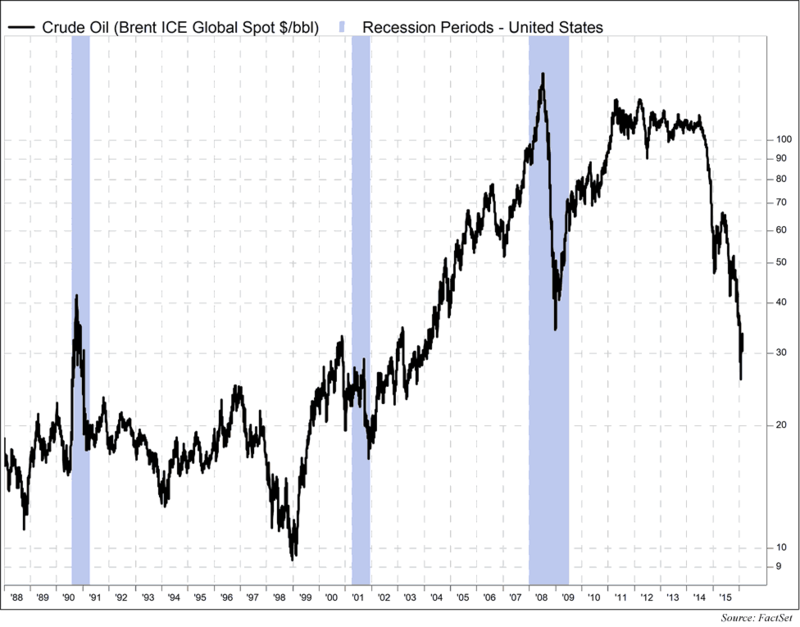 Exiting the 1990-91 recession (shaded bar), the price of oil traded between a high of about $30/bbl in late 2000 and a low of about $10/bbl in late 1998. However, exiting the 2001 recession oil moved from about $20/bbl at the end of 2001 and peaked in mid-2008 close to $150/bbl. This period between 2001 and 2008 was commonly referred to as the “Commodity Supercycle”. The main catalyst for this surge in oil (as well as most commodities) was the strong economic growth in China. 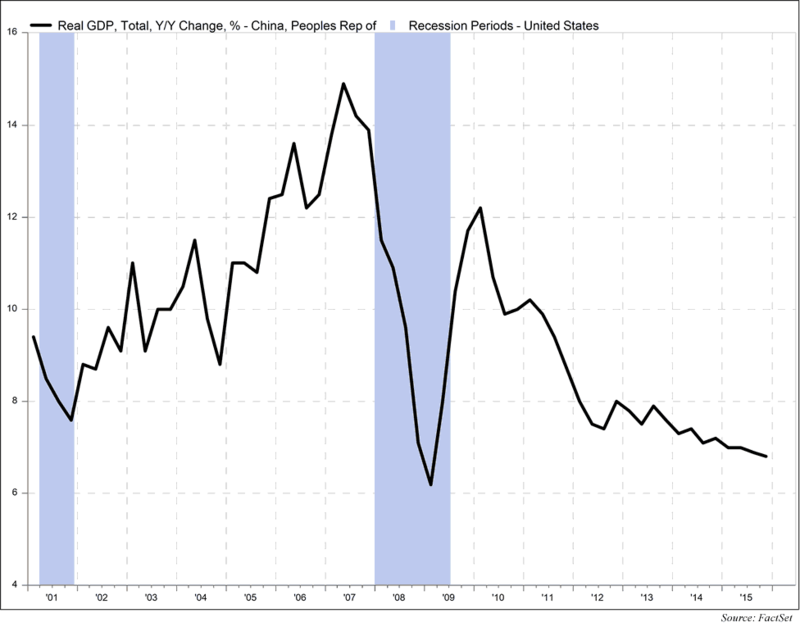 Between 2001 and late 2007, the year-over-year growth of China’s real (adjusted for inflation) GDP accelerated from 8% to about 15% (see chart below). Not only was this economic growth rapid, but its underpinning was massive investment and production growth. This form of economic growth and the overall rate of growth produced very strong incremental demand for oil and other commodities, hence the “Commodity Supercycle”. The downside to this kind of rapid growth is that it is unsustainable. After peaking in 2007, the year-over-year growth rate in China’s real GDP has slowed and was less than 7% at the end of 2015. In fact, after seeing 12% year-over-year growth in early 2010, it slowed sharply to around 7.5% in 2012, and has drifted lower since. So China’s economic slowing is not a recent event. Not only has China’s overall economic growth been slowing but it is no longer being driven by investment and production. China’s economy is rebalancing away from production and more toward consumption. A consumption-driven China economy does not create the same incremental demand for oil and other commodities as an investment- and production-led economy. In the meantime, the higher oil prices sowed the seeds for a revolutionary new drilling technology called fracking. This new technology has dramatically increased the available supplies of oil and natural gas. Softer incremental demand and stronger incremental supply have brought an end to the “Commodity Supercycle”. This has been very difficult for economies built on selling petroleum products such as Russia, Brazil and most of the Middle East countries. It has also had a very negative impact on the local economies in the United States that benefited from fracking such as North Dakota, Texas and others. That being said, the overall US economy is not dependent on the production of petroleum products to drive growth. In fact, lower energy prices are a net benefit. About 75% of the US GDP is made up of services and non-durables. The energy sector makes up less than 1% of total employment and less than 5% of overall corporate capital spending. How does all this relate to the stock market? We think the best way to address this question is to revisit stock prices within a framework of earnings and valuation (price-to-earnings or P/E ratio). That is, changes in stock prices equal changes in earnings and changes in valuation (∆Price = ∆Earnings + ∆P/E). The chart below presents the weekly price of the S&P 500 index (The Stock Market) and the forward earnings for the next 12 months. The strong direct relationship between prices and forward earnings is evident in the .90 correlation (1.00 is perfect) over this period. The other important factor is the valuation or price to next 12 months earnings. 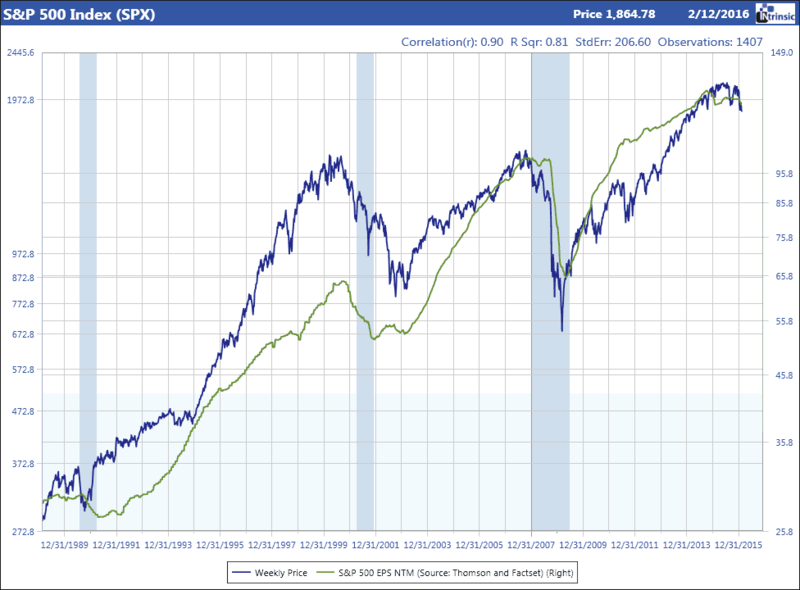 The chart above presents the price to next 12 months earnings ratio for the S&P 500. Over this time it is evident that this P/E ratio has moved up and down sharply but on average has trended sideways. In the 1990s, low inflation and strong technology growth drove the market to unsustainable mid-twenties multiples which ended badly for many investors. 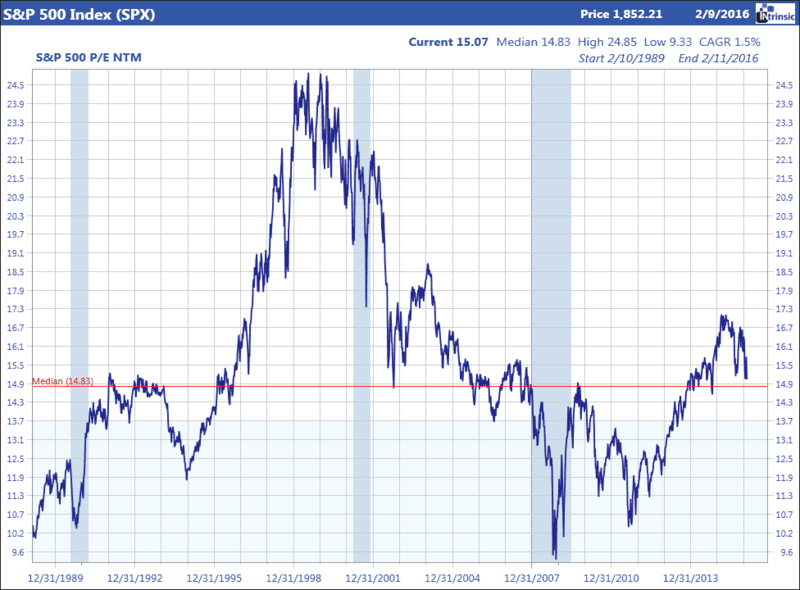 Following the 2001 recession, valuations trended lower on rising inflation concerns from the “Commodity Supercycle”. The recent bottom was reached at the end of 2008 when the “Great Recession” and related financial panic was in full swing. Since February 2009, prices have trended higher due to earnings growth and improving PEs. However in 2015, forward earnings moved mainly sideways causing renewed concerns. From an overall index level the mainly flat year does beg the question of whether or not it is signaling macro growth problems. Like many things, we believe the answer lies in understanding the dynamics inside the overall index. Presented above are the 10 sectors of the S&P 500 Index and the percent each represents of the total. Next are the actual earnings per share for each sector and total index from 2013 to 2017E (estimate). Finally, the year-over-year changes are presented. Note the highlighted areas. In 2015 the earnings per share for the Energy sector declined by 60% from $42.58 to $16.93. Similarly, the Materials sector experienced a 6% decline. Otherwise all other sectors were flat to plus double digits. Clearly the decline in the price of oil was a major impact. In addition to lower oil prices, the value of the US dollar relative to other currencies increased by about 15%. The stronger US dollar negatively impacts reported revenues and earnings generated outside the United States. For 2015, it is estimated that lower oil prices decreased overall earnings growth by 4% to 5% and the stronger US dollar lowered earnings growth by 2% to 3%. If these estimates are close, excluding the oil and dollar impacts, earnings growth in 2015 would have been closer to +6% to +8%. Looking at the current estimates for 2016, Energy earnings are now expected to decline another 50% from $16.93 to $8.49 and Materials are expected to be relatively flat. Likewise, earnings estimates for Financials, Healthcare and Consumer Discretionary sectors (which combine comprise 43.3% of the total index) are all expected to decelerate this year. Overall earnings growth estimates for the S&P 500 Index now stand at only +4% for the year. In our opinion, the current expectations for 2016 already factor in the latest weakness in oil and seem to imply further dollar strength and slower global economic growth. What does this mean for the stock market in 2016? Since we believe next 12 months earnings provide the most useful information, if we are trying to determine a price target for the end of 2016 we need to look at 2017 estimates and consider various price-to-earnings valuations. The current consensus earnings estimate for the S&P 500 in 2017 is $136.87, which is 13.1% above the 2016 estimate of $121.00. Know that as we move through 2016, the 2017 estimate will be revised to reflect present expectations. With this in mind we feel a range of $130 to $140 is reasonable. This covers a range of 7% to 15% earnings growth from the current $121.00 estimate for 2016. The current price to forward earnings multiple is about 15 times. At the start of the year the P/E was closer to 16.5 times. Using a PE range of 15 to 16.5 for the year, the resulting price targets (Earnings X PE) fall between 1950 and 2310. This would represent either a 4.6% decline or a 13% appreciation from the start of the year value of 2044. There will not be an economic recession this year. The severe weakness in the energy sector has negatively impacted economic growth in 2015, but its impact in 2016 will likely be less than 2015, and overall it is too small relative to the overall economy to cause a recession. It’s worth remembering that lower energy prices, while painful for energy producers, are a positive for energy users. The energy users’ portion of our economy is significantly larger than the energy producers’ portion. From an earnings standpoint the stock market seems to already be discounting continued weakness in the Energy sector as evidenced by the 2016 estimate of $8.34 which is half the amount earned in 2015 and 80% below the amount earned in 2014. While the US Dollar has been stronger relative to other currencies in 2015, most of the change occurred in late 2014 and the year-over-year comparisons are likely to be less in 2016 versus 2015. From a global economic perspective, while the unwinding of the “Commodity Supercycle” has been particularly challenging for energy producing countries it is a net positive for energy consuming countries that are significantly larger and more meaningful. With this as our framework we currently feel that narrowing the P/E range to 16 to 16.5 times is reasonable (close to or slightly below where we started the year). This results in a S&P 500 price target range of 2080 to 2310 which translates to 2016 estimated appreciation of +2% to +13%. Given that in 2015 it was estimated that earnings would have been up 6% to 8% without the impact of oil and the dollar, and that both of these factors will likely be less impactful in 2016, we would base our predictions on the upper end of this +2% to +13%. Making stock market predictions is always dangerous because so many variables can change during a year. Hopefully we have demonstrated the difficulty in this process even when narrowing it down to the simple formula of ∆Price = ∆Earnings + ∆P/E. The real value in process is not arriving at a single target price or even a narrowed range but instead is to provide a productive framework to assess the current investment landscape and get a sense of what is already expected. From here we can begin to assess the probabilities of various outlooks. We believe 2016 could end up being a very good year for the stock market. As the backside of the “Commodity Supercycle” is better understood and the positives for oil and commodity users are appreciated, concerns should fade. A resumption of growth in forward earnings should go a long way in reducing fears and creating some positive price momentum again.